They are stunning Lori but then you have such brilliant taste. You have a lovely week my dear. Beautiful. The necklace is especially stunning. Wow, Lori! I love what you did with those vintage beads! Mrs. Claus, LOL! No, definitely not. It's all lovely! That bracelet is so creative! I love the way you put those flowers together. Great job, Lori! Thanks for that inspired post Lori, I'd never thought of using lucite beads in clusters like that, you've created a stunning effect. Oh I LUV LUV the vanilla poppies!!!!!!! I neva would have thought about the cream with orange!!! FAB! That Christmas necklace is so pretty! I read The Historian in fall 2008 and loved it! I have read many reviews of it and realize that it's one of those books that people either love or loathe. I think it's wonderful. I love the travel through Europe, the lore, the mystery and suspense. Some nights I went to bed a little spooked (but hey, I'm too disorganized for Vlad to want me in his library!). I really appreciate the research Kostova did to write this book. I hear it took over 10 years to write. I'm reading it a second time now, but unfortunately I've had to set it aside for a few weeks while I finish up classes and move. Thus the reason it's been on my "Currently Reading" feature for waaay too long. I'll already tell you that I notice it reads differently the second time around. I suppose it's because there's a lot less mystery. Very Cool Lori! Love the vintage beads, so pretty and the color is perfect. Thanks for stopping by to check out my Birthday "Hunk". He was found at a rummage sale. I could not resist. Sorry about the links to Caron and the wonderful little frog. If you go to www.caron.com and then click on caron connections (at the top), *it* should take you to all the *newsletters* and the Twelve Days of Christmas and the Froggy! 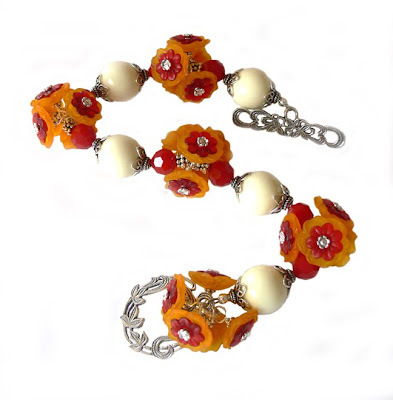 I love the vintage beads included in your beautiful pieces. The red necklace is outstanding! Gorgeous Lori! I love LOVE LOVE the clustered look! 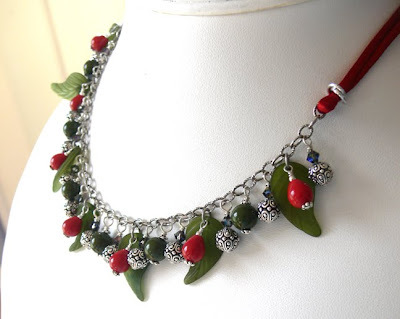 And the holiday necklace with the silver & the leaf beads is fabu & rich looking too!